Purchase our DVD "Hard Times, Hard Work" for $12.25 (includes tax & shipping). 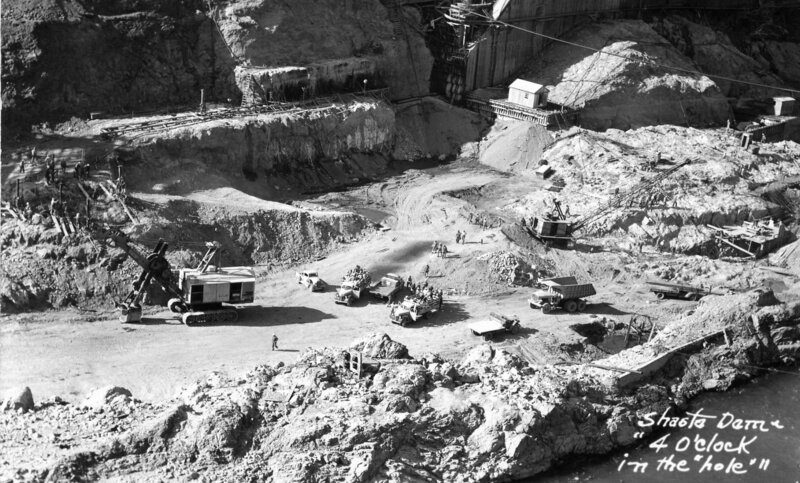 2009 "HARD TIMES, HARD WORK" with over 200 photos, this 50minute video is first in a series about the men who came to work on Shasta Dam & the construction years 1938-45. It includes: narrations on short stories & photos from our library on Pit River Bridge, Keswick Dam, the railroad tunnels, Toyon (Government Camp), Shasta Village/PCI camp (Pacific Constructors Inc.); digitized earlier taped interviews of dam workers recorded as a school project in the Seventies; a short video clip of interviews from the Damworker's Reunion 2009, and many family & historical photographs. People identified in a photo, interview, narrative or quotation: Asher, Bakaloff, Barbera, Barger, Bernard, Brock, Brown, C., Brown, D., Bryant, Burhley, Burge, Carleton, Carter, Cox, Crandall, Cross, Crowe, Cullis, Dashen, Davidson, Davis, B., Davis, T., Dollarhide, Elverurd, Endicott, English, Fish, Fitzgerald, Forte, Foxx, Frisbie, Garner, Gershanoff, Gibbons, Granger, Halcomb, Haner, Harter, Hedstrom, Heidel, Heikka, Henderson, Herring, Hilburn, Hoppes, Horner, Hubbard, Huey, Humphreys Jr., Jensen, Johnson, Jones, Kank, Kennedy, King, Lee, Lefler, Livingston, Lord, Lower, Lynch, Marx, McFate, McGregor, Miller, Montelius, Mosher, Moxley, Naylor, Nelson, Pederson, Pickard, Powell, Richards, Rogers Sr., Rumboltz, Ryan, Saunders, Shelton, Silva, Smitty, Stinson, Stotts, Taylor, Terry, Trapp, Ures, Vivant, Voges, Wade, Warmack, White, Williams, and Withers.